Christa is my first cousin/twice removed. Well, it goes like this: my Dad has an older sister. She's my aunt. It also happens that my Dad and his sister are about 11 years apart. She got married early and had her daughter early. My Dad did not. There is about 20 years difference between my cousin and myself. Now for the last little bit ... pay attention now! ... my cousin's son also got married early and had a daughter, Christa, early. She is technically *two* generations removed from me, hence she is my first cousin/twice removed. Eventhough *she* is in the same age as *my* children! Now, it happens that Christa had a rather chaotic childhood. Family connections are important to her. So when she told us that she was getting married, I knew I wanted to give her something special ...and not just another crockpot. 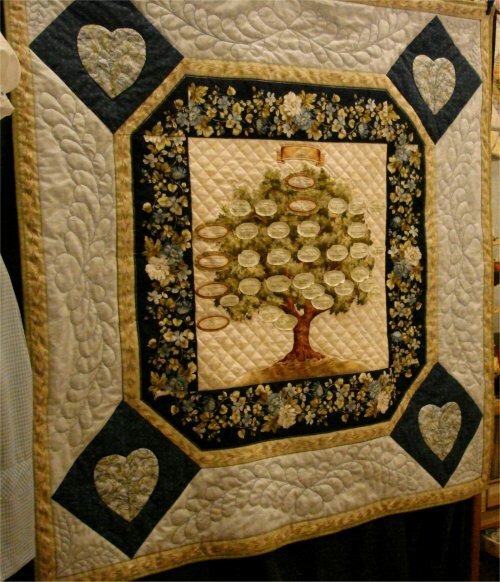 About that time, I had seen in one of the quilting magazines, a printed panel for a family tree. *This* would be the foundation for a quilt for Christa. I'm the family geneologist, so I know all the names and how people are related to each other. I made small ovals for each family member, starting with our common ancestor, who would have been my grandfather. From my grandfather to each succeeding generation, I embroidered the name of each person and connected all the ovals of a family line. For her own family line, I used a different color embroidery thread. HOWEVER ... we arrived at the motel in the evening and I didn't think of taking a picture of the quilt. The next morning, we were concerned about getting to the wedding venue on time and I didn't think abut taking a picture of the quilt. It wasn't until we were on our way back home that I realized ..... I hadn't taken a picture of the quilt! Christa said she'd take one for me. But months passed and she never did. I felt awkward about making repeated requests, so I eventually stopped. And then tragedy happened ... they hadn't even celebrated their one year anniversary when her husband died. It was very unexpected and a total shock. It was .. and continues to be .. a very rough time for her. So ... the picture above is the ONLY picture I have of the family tree wall-hanging and that one was before I had stitched all the hand embroidered family lines.